The United States Congress designated the North Fork John Day Wilderness (map) in 1984 and it now has a total of 120,998 acres. All of this wilderness is located in Oregon and is managed by the Forest Service. The North Fork John Day drainage bustled with gold and silver mining operations in the mid-1800s, and traces of the thousands of hopefuls who made off with an estimated 10 million dollars in ore are still visible in this Wilderness. As you hike on one of the many trails you will see old mining structures, building foundations, and dredged ditches as well as the trash dumps left behind by the miners. But the rolling benchlands, granite outcroppings, and the rugged gorge of the North Fork John Day River have recovered enough to provide an excellent Wilderness setting here in the Blue Mountains. The Wilderness encompasses two entire subranges: the Greenhorn Mountains and the ragged Elkhorn Mountains. A 39-mile segment of the North Fork John Day River has been designated as a Wild and Scenic River. This area deserves its fame for big-game animals, which currently include a herd of Rocky Mountain elk estimated to number beyond 50,000 and a herd of mule deer that reportedly exceeds 150,000. Bull elk here sometimes weigh more than 800 pounds and sport antlers spreading beyond five feet. The area's anadromous fish population (fish that spawn in fresh water and swim to the sea) include vast numbers of chinook salmon and steelhead with runs that peak in August. More than 130 miles of perennial streams provide at least 40 miles of spawning habitat. 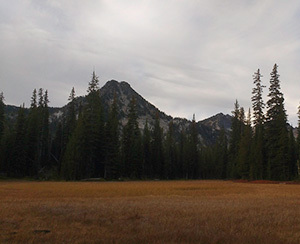 This Wilderness consists of four separate units: the main unit of the North Fork John Day drainage, the Greenhorn Unit to the south, the Tower Mountain Unit to the north, and the Baldy Creek Unit to the east in the Wallowa-Whitman National Forest. A portion of the cirque basins and steep cliffs within the Vinegar Hill-Indian Rock Scenic Area also lie within the Wilderness. Hikers can access roughly 133 miles of trails, three of which--Elkhorn Crest, Winom Creek, and North Fork John Day--are National Recreation Trails, from several trailheads on the perimeter of the wilderness. The Elkhorn Crest Trail soars for 24 miles through alpine scenery. The North Fork John Day Trail follows the river gorge for 25 serpentine miles along which you will see the remains of gold mining activity. You should expect a significant amount of elevation gain and loss while hiking in any of the subunits. Planning to Visit the North Fork John Day Wilderness? How to follow the seven standard Leave No Trace principles differs in different parts of the country (desert vs. Rocky Mountains). Click on any of the principles listed below to learn more about how they apply in the North Fork John Day Wilderness.